The daughter of the pilot killed in what, until Flight 370, was Malaysia's deadliest aviation crash talks to Phil Taylor about living with the disaster. Devika Ganjoor Erickson holds the small framed photograph of a handsome man with a crafted beard. Her father, she says, was known for his beard. It is the only picture she has of him in her Beachlands house. Before the birth of her son, Marc, nine months ago, she didn't even have this one. The constant reminder of what happened to him, and what happened to her, her brother, Vivek, and mother, Sunita, afterwards was too painful. But with the arrival of a new generation, her mother insisted she have it. The families of those on board missing Malaysia Airlines Flight 370 have been waiting for answers for 37 days. The loved ones of those who perished on Malaysia Airlines flight 653 have been waiting 37 years. Erickson, who emigrated to Auckland 12 years ago, her mother Sunita and brother Vivek, who live in India, are among the latter. • How can an airliner fly under the radar? Flight 653 was hijacked in 1977 on its way from the northern Malaysian city of Penang to the country's capital, Kuala Lumpur. The Boeing 737-200 crashed into a mangrove swamp killing all 100 on board. It was the deadliest incident in Malaysian aviation history until Flight 370 vanished on March 8 en route from Kuala Lumpur to Beijing with 239 people on board. Questions remain despite the cockpit voice recordings capturing everything from the breach of the flight deck to the sound of the gunshots that killed the co-pilot and the pilot, Erickson's father Captain G. K. Ganjoor. "I really feel for them," Erickson said of the families desperate that the search in the southern Indian Ocean will provide answers to the fate of Flight 370. The families of the victims of Flight 653 have had to learn to live without answers. "Thirty-seven years on we still don't really know the truth. It is still known as 'the mystery crash'." Recovery of the black box enabled investigators to confirm both pilots were shot while flying the plane. "But the mystery remains as to what exactly happened and why," Erickson said. "The headlines at the time just said 'foreign terrorists'. No one knows who, or why." Some details of the cockpit recorder were made public. "Either my father or the co-pilot was pleading, 'please don't shoot', and then shots rang out." The hijacker or hijackers of MH653 have never been identified. 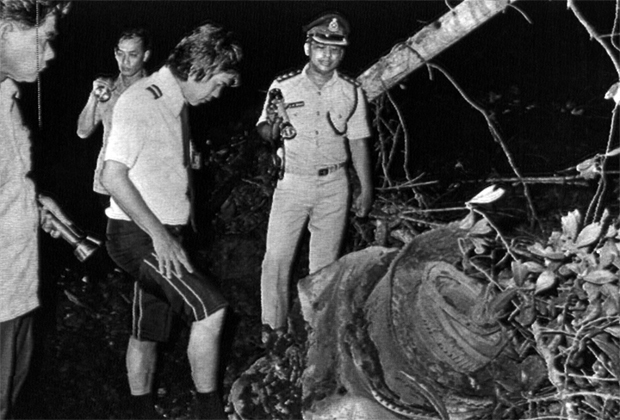 The aircraft was hijacked as it approached Kuala Lumpur on the evening of December 4, 1977, according to the Malaysian Civil Aviation Department's report. Soon after the plane began its descent, Captain Ganjoor radioed the control tower: "We have an emergency on board". Asked to clarify, he said, "We have a hijacker on board." Amid confusion over whether it was to land there, it proceeded towards neighbouring Singapore. As it descended, the crew was shot and the aircraft "carried out some unusual pitch up and pitch down terminal manoeuvres before finally impacting into swampy ground at some 450 knots". Such was the velocity, no identifiable bodies were found. The report concluded that the crash was caused by the crew being fatally incapacitated, leaving the aircraft "professionally uncontrolled". Erickson: "He was murdered while on duty and we just don't know why." The families with loved ones on board Flight 370 were unlikely to get the answers they want. "People keep talking about closure but in a case like this, even if by some miracle, God-willing, they find the wreckage or whatever has happened to that flight, there will never be closure because you always have that sense of loss, that grief, that missing person from your life. "And every year that anniversary, that 8th of March, that 4th of December, will be a constant reminder as long as you live. So, where's the closure? There is no closure." Her father's death left her mother a widow at 30 with children aged 5 and 18 months and a dramatically changed life. It occurred the day after their wedding anniversary and the day after Ganjoor completed 21 years of flying. Erickson, who was 5, has memory "flashes": with her dad at a Disney On Ice show, a fatherly cuddle, her mother at home inconsolable while surrounded by people. She's been told that she repeatedly asked where her father was. He was a voracious reader, a keen cook, who loved squash, tennis and horseriding, an amateur actor and poet and a university boxer. "We lost out on those rich experiences, as well as missing a father figure. "It was incredibly hard for my mother." Ganjoor previously flew for Indian Airlines and the family had moved from Lucknow, in India's northeast, to Kuala Lumpur four years earlier for her father's job and were isolated from family. Erickson feels the airline should have done more to help her mother. She said that two days after the crash, while in shock and without legal advice or family support, her mother signed a document at the request of the airline that waived her legal rights. "She was shell-shocked. She would have signed anything." The airline gave about a year's salary as full and final compensation from which a fifth was deducted in death duties. The remainder was divided with Ganjoor's wife and two children from a previous marriage. The family's privileged lifestyle - they had two maids - changed overnight. "Mum was a housewife, a very spoilt housewife, and suddenly to go from that to literally wondering how she would feed her kids, was very hard. It was a hand-to-mouth existence." After pleading with the airline for a job, her mother was given a low-paid clerical role and told she could never be promoted to a higher-paying job because she was not a Malaysian citizen. Her mother did that job until retiring at 55 and returning to India where she lives in a small apartment. Her mother's requests to the airline for help to pay for costly English language schooling in Malaysia were declined, said Erickson, because her father was an expatriate. Consequently she and her brother were sent to India for some of their schooling. Her mother lost the free travel benefit that came as a pilot's spouse and though her job made her eligible for flight concessions there was never money for family holidays. A trip to McDonald's was a treat, Erickson said. "I felt we were being punished for something that wasn't our fault." "The airline just didn't have any heart to deal with it properly. It has not been done right by my Mum. She should not have gone through what she's gone through; for a young widow to be struggling so much." Erickson last year flew to India on Malaysia Airlines to visit her mother. "I found it a bit strange to pay full fare on an airline that my father died for while on duty." A recent request for the airline to help her with flights was declined, she said. The airline did not respond in time for this article to the Herald's request for comment. "I feel very strongly about it," Erickson said. "It's not too late to right what was done wrong." • Flight 653 was hijacked in 1977 on its way from the northern Malaysian city of Penang to the country's capital, Kuala Lumpur. • The Boeing 737-200 crashed into a mangrove swamp killing all 100 on board. It was the deadliest incident in Malaysian aviation history until Flight 370 vanished. • Recovery of the black box enabled investigators to confirm both pilots were shot while flying the plane. • The aircraft was hijacked as it approached Kuala Lumpur on the evening of December 4, 1977. • As it descended, the crew was shot and the aircraft crashed into swampy ground at 450 knots. Such was the velocity, no identifiable bodies were found. • The hijacker or hijackers of MH653 have never been identified.